From right to left: Mr. Barbosa, Assistant Director-General of UNESCO, Mr. V. Anadasangaree, and SAF Founder Madanjeet Singh. Mr. Madanjeet Singh’s address on the occasion of the award ceremony of 2006 UNESCO-Madanjeet Singh Prize for the Promotion of Tolerance and Non-violence to Mr. V. Anadasangaree. "It is a great honour and privilege for me to congratulate Mr. V. Anadasangaree, the 2006 Prize laureate of the UNESCO-Madanjeet Singh Prize for the Promotion of Tolerance and Non-violence, on winning this significant award. A devoted and tireless worker for the cause of peace and democracy, he has consistently opposed terrorism and violence. After working as a teacher and lawyer, he became the President of the Tamil United Liberation Front in 2002. In that capacity, he has been devotedly trying to find a common ground among the people of Sri Lanka to solve the ethnic conflict through dialogue in a spirit of tolerance and non-violence. The work of Mr. V. Anadasangaree in promoting peace and dialogue is of the utmost importance. This was underlined by the recent assassination of Mr. Nadaraja Raviraj, a prominent representative of the Tamil community and a member of the Sri Lankan parliament. Mr. Raviraj rose to the position of attorney in 1987 and was an indefatigable advocate of the rights of the Tamil community. At the same time he was a popular figure among the Singhalese as he promoted peace and friendship among the two communities. He regularly participated in peace rallies and his last public demonstration took place in front of the UN office in Colombo, protesting the civilian killings in Vakarai. “The ethnic problem can be solved only through peaceful means”, he said, “war was mutually destructive to both communities”. May I also mention that even though a year has passed since the Foreign Minister of Sri Lanka, the Hon. Lakshman Kadirgamar, was also assassinated, I have yet to get over the tragedy. He was a good friend, whose advice I greatly valued. 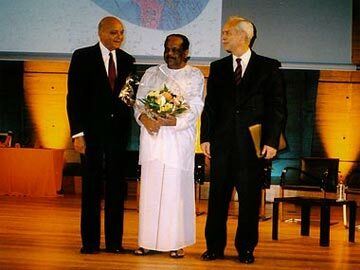 He was also the first chairman of the Sri Lankan chapter of South Asia Foundation (SAF). This institution is being set up within the framework of SAF million dollar Institutions of Excellence, like the Madanjeet Singh Institution for the Preservation of Afghanistan’s Cultural Heritage which was opened in Kabul on 13th July 2006 in cooperation with UNESCO. The cardinal objective of the South Asia Foundation is to promote regional cooperation and peace through education, cultural interaction and mutual understanding among the people of South Asia. As a citizen of India it makes me proud to belong to the world’s largest democracy with a Hindu majority, a Muslim President, a Sikh Prime Minister and a Christian as the leader of the largest political party. I believe that history is not merely a series of accidents. It is a never-ending struggle between reactionary, divisive warmongers and people striving to realize their dream to live peacefully in cooperation with one another in a society where men and women love reason and reject violence. The work of Mr. Anadasangaree and people like him whose minds are sensitive, whose hearts are generous and spirits free, is of fundamental importance in promoting peace not only in Sri Lanka but in all South Asia".